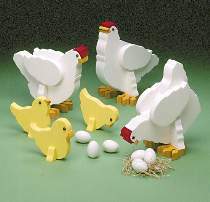 These chickens come apart for compact storage or they can be attached permanently with glue. Plan includes FULL SIZE patterns for all six projects. Made from 3/4" and 1-1/2" stock. Measure 10"H. Order 2 eyes (1 pair) for each chicken or chick you (build available separately below).